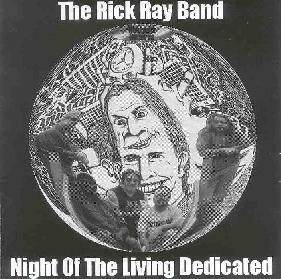 The Rick Ray Band - "Night Of The Living Dedicated"
Rick Ray is back with a new one. What a surprise, huh? He is without question the most prolific artist on the heavy rock scene, and probably most others. And that's ok because Rick proves from one album to the next that he's still got a lot of music that's busting to get out. Night Of The Living Dedicated is the third album in a row to feature the full Rick Ray Band, and a hot set it is. "It's Time" and "The Casualty Score" are the opening numbers and are classic Rick Ray, with soulful vocals from Phil Noch and a pounding rhythm section with a bit of a boogie woogie grind. And "The Casualty Score" scores high marks with the kind of ripping guitar and reeds dueling that makes the Rick Ray Band unique among heavy rockers. Along similar lines is "Wired Wrong", a blazing rocker with heart attack power chords and pyrotechnic leads that closes the album on an fiery note. "Zero" and "Containment" are among the easier paced tunes of the set, with great melodies but a still heavy rocking guitar sound. And I love the freaky outro bit at the end of "Containment". Very cool Rick. In fact, "Containment" and "Day Of The Watchmen" have a radio friendly quality, though we'd probably need a return to the 70's for this kind of stuff to hit the radio waves. Accessible songs but well composed and played and loaded with tasty instrumental fills. "The Ugly Puppet's Head" is an emotional guitar lovers tune that draws in part on Rick's Robin Trower influences, but is also a poster song for Rick's expressive style that demonstrates both passion and proficiency. And "Calm Before The Storm" is a beautiful multi layered acoustic instrumental that would be very much at home on an Anthony Phillips Private Parts & Pieces album. "I Was Wondering" is one of two lengthy tracks, but was a little disappointing in that it didn't quite justify it's 10 minute length, and would have been stronger being trimmed down to the 4-5 minute range. But the other extended track of the set, "The Civilized War", is a 12 minute fist pumping powerhouse rocker with prog rock tendencies. Gary Wood's vocals didn't knock me out on most of the songs he sings on but this one is tailor made to his singing style. The whole track consists of incessant driving rock with complex instrumental constructions and luscious Rick/Rick guitar/reed tradeoff riffing. Some of the best playing I've heard on any Rick Ray album. Yeah, this is THE monster track of the set. I am satisfied, satiated and drained. It's amazing that with the amount of music he has released in the past several years that Rick is able to keep things consistently exciting from one album to the next. Heavy rock fans step right this way.